An estuary is a body of water that lies between a river and an ocean. The fresh and salty waters mix together, resulting in a change in both the flow and the salinity of the water. An estuary can be either completely closed in by a ‘bar’, or partially enclosed by a ‘mouth’. Each estuary has its own distinct characteristics that influence the type and number of plants and animals found within its waters. 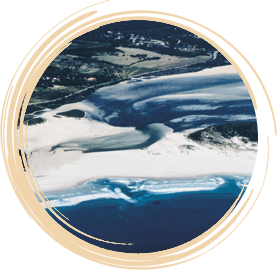 In Western Australia, estuaries are unique and complex systems – characterised more by the salty ocean water flowing into the river system than the flow of fresh water due to rainfall out to the ocean. This is due to the Mediterranean climate of southern WA, with dry summers and wet winters. In winter, the water is fresher as the run off from seasonal rains flush the river. In summer, the water becomes saltier as the river’s rate of flow lessens. Sea water flows into many estuaries for most of the year, thus the areas near the mouth are like an extension of the ocean.